This past year and already into the new year I have been busy teaching French Boutis classes and designing new patterns. I also have done several quilt trunk shows for quilt groups. After many months my new French Boutis Zippered Bag pattern is published on Etsy as a complete kit and as a PDF downloadable pattern. The small bag when completed measures about 5 x 7.5 inches. It has a 12 inch zipper and is lined with beautiful fabric. Once again French Boutis is an ancient art. Simply done, two pieces of special fabric are sewn together with a small running stitch (quilting stitch) on drawn pattern lines. Then a double strand of Boutis yarn is drawn through the channels from the reverse side giving the piece a raised relief. (Similar to trapunto but has no batting.) Traditional Boutis is done on white batiste fabric. However, I have fallen in love with the Provencal bright colors. Hence my colorful kits. Luscious Provencal colors are available with the kit including beautiful lining fabrics. 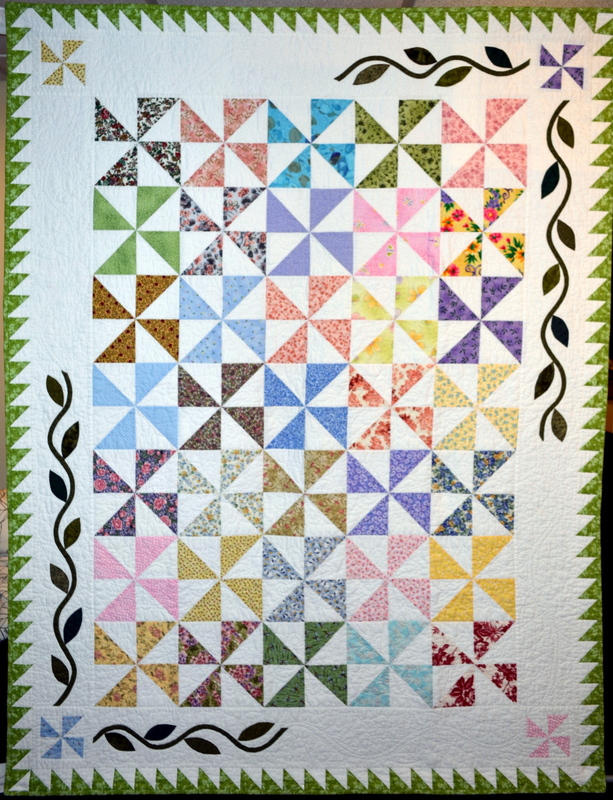 The fabric is 100% pima cotton and the linings are carefully chosen 100% cotton quilting fabrics. For those not interested in a kit, the pattern and instructions are available in PDF downloadable form. However, the pattern must be enlarged 129% from 8-1/2 x 11 inch paper to 11 x 17 inch paper. It was reduced for ease in printing. A full size pattern is included in the kit. 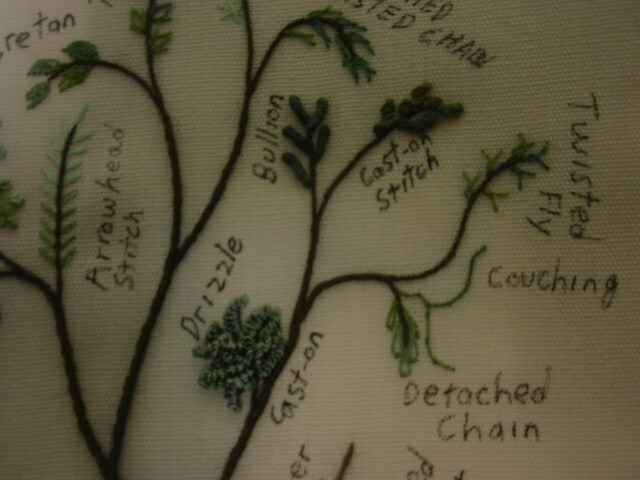 Alas there has not been much time left for my other interests such as stitching. I hope this year allows more time and better health! Please visit me on Etsy or Instagram at “Averyclaire222“. The king sized quilt was on the frame by the end of June. The borders took a long time to finish and then even longer to blanket stitch all those tiny designs I created! 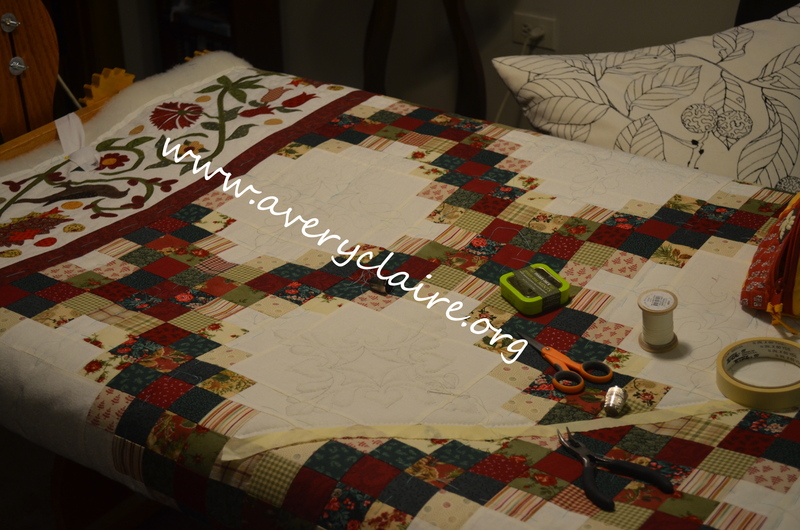 With the busy summer and lots of traveling the actual quilting has been slow going. Here is a photo of the giant first being basted and then on the frame. 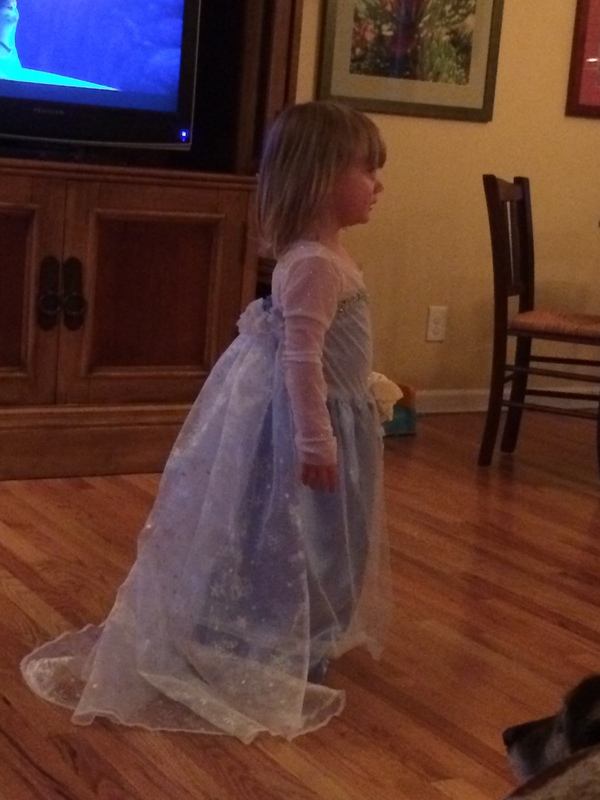 In the meantime, I did create an adorable “Frozen” princess dress for my three year old granddaughter, Maya. Lots of traveling included a week in the woods of southern Indiana in June for DH’s hobby interest. Then we did two weeks out west in Boulder, Colorado and the Black Hills of South Dakota in July. 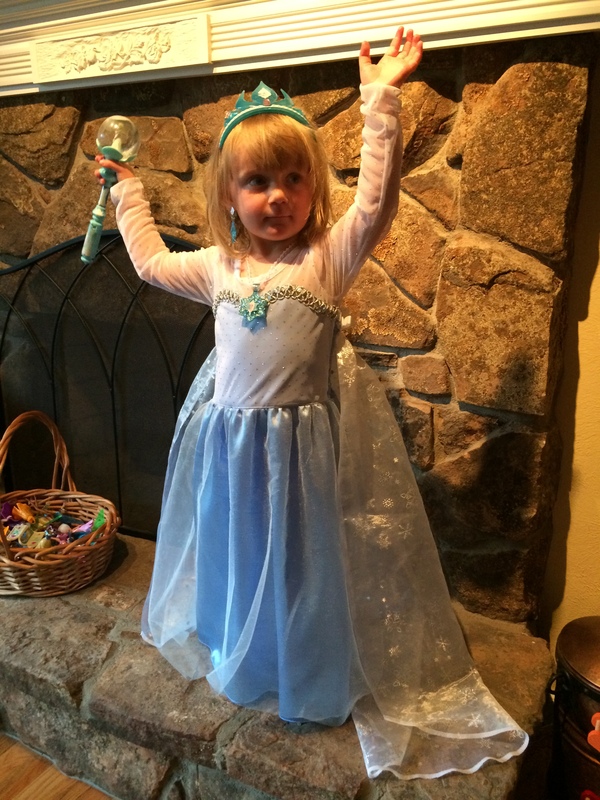 We took a couple of grandchildren with us and my oldest granddaughter broke her arm the first day we left! Next we spent ten days in Atlanta, Savannah, Tybee Island, Hilton Head, and Charleston, SC in Aug for a woodworking convention and just R&R for the two of us. And one more week in the woods of southern Indiana in September at which time I did a lot of sewing on baby blankets in our RV! Whew! Fun, but nice to be home. 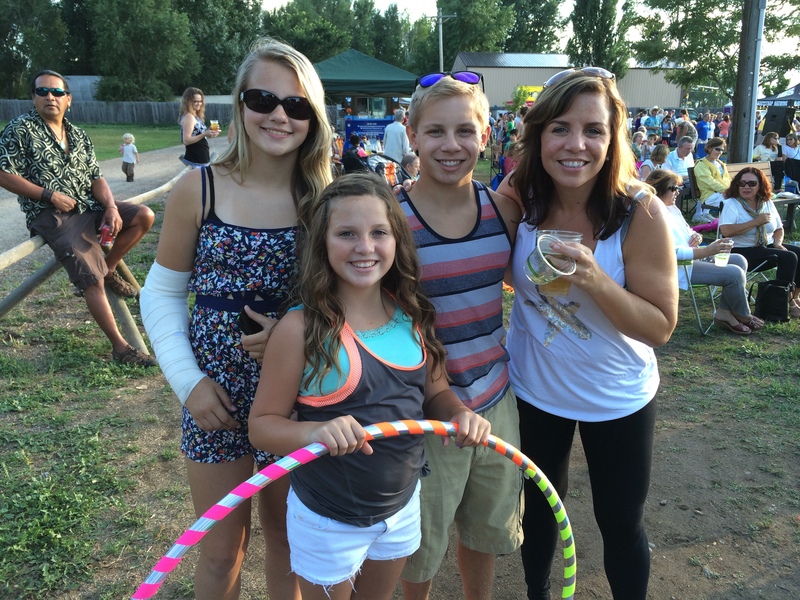 Grandchildren…Haley, Sophia, Noah and daughter Kathleen enjoying the Niwot, CO evening concert. 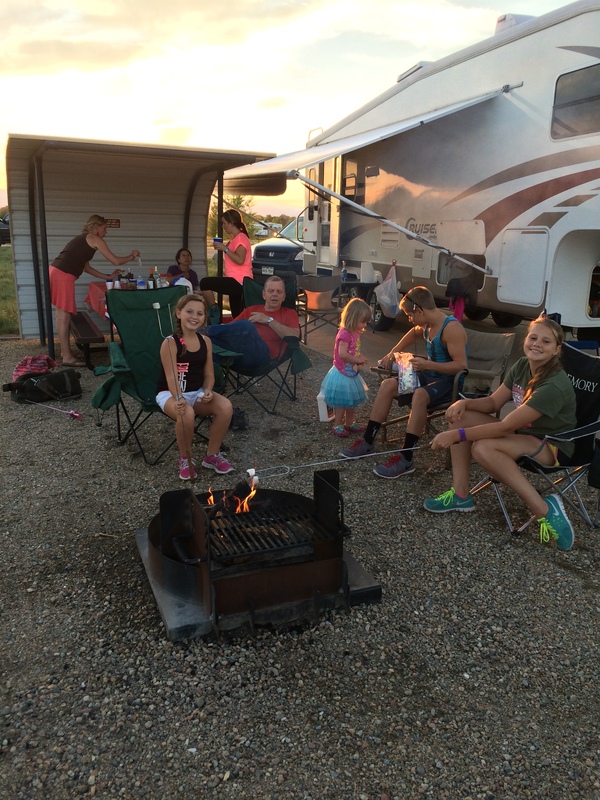 We had a GREAT family campout while in Boulder, CO. 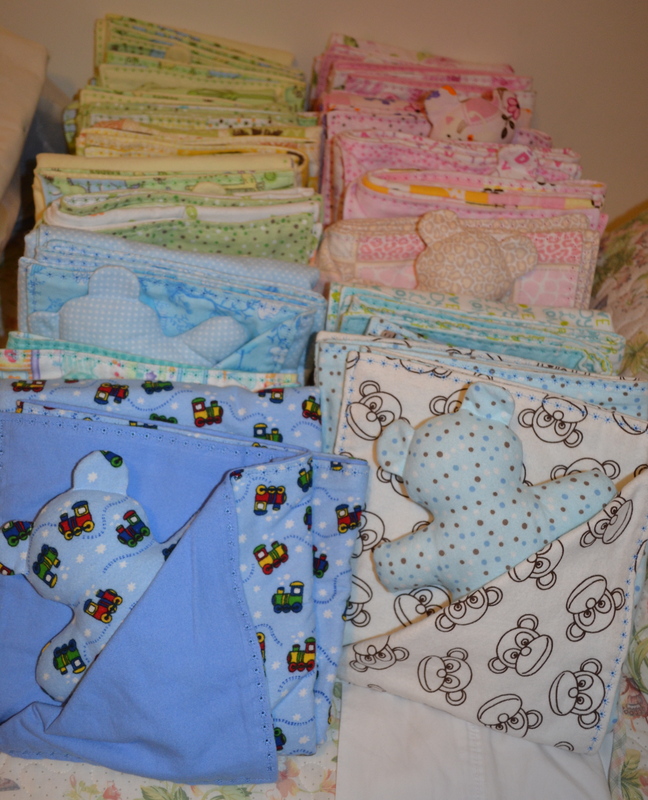 Since then I have completed 20 baby blankets with teddy bears for my Quilters’ Plus Holiday Boutique coming up November 7 and 8. My heart wanted to do a lot more projects for the Boutique, as some of the money goes to support our group, but alas, I did not do what I had hoped to complete. Oh well, there is always next year. Some of my blogging buddies have been wondering where I have been. Just busy with life and trying to avoid spending time on the computer fighting with downloading photos, etc. It has been a nice respite. However, I do lurk behind the shadows and visit all of your blogs often. 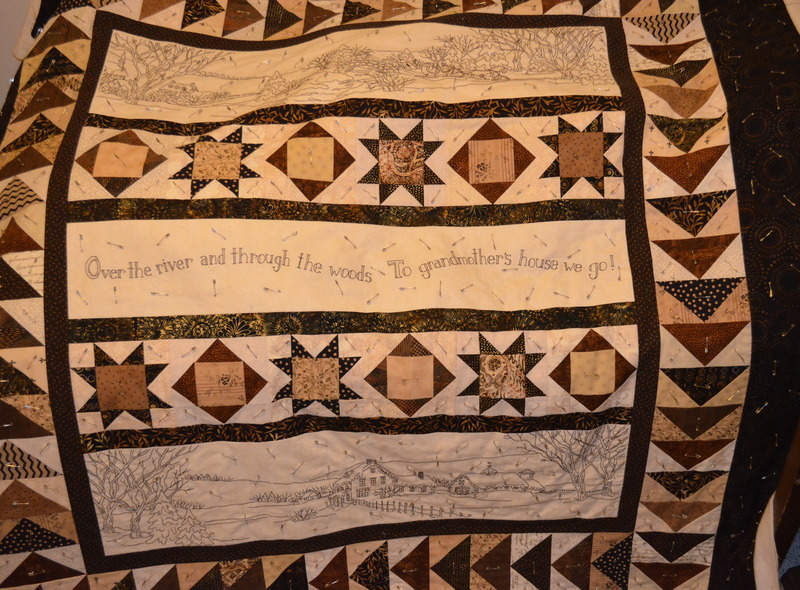 I hope before too long there will be some stitching and other quilt items to show. But my progress is SLOW. After completing a couple of needlework projects, I turned to my quilting again. 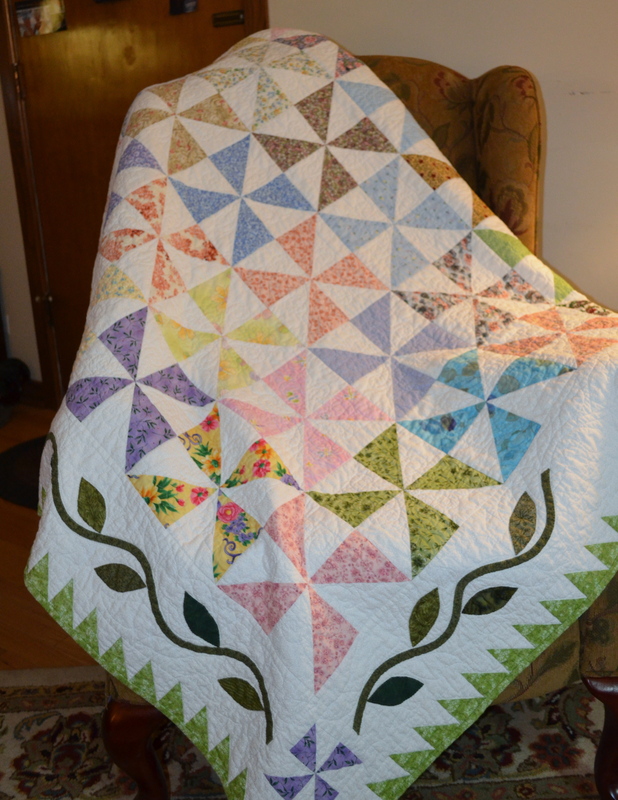 I made this twin-size Pinwheel quilt top some time ago (perhaps a year or two) and finally layered it and machine quilted it. 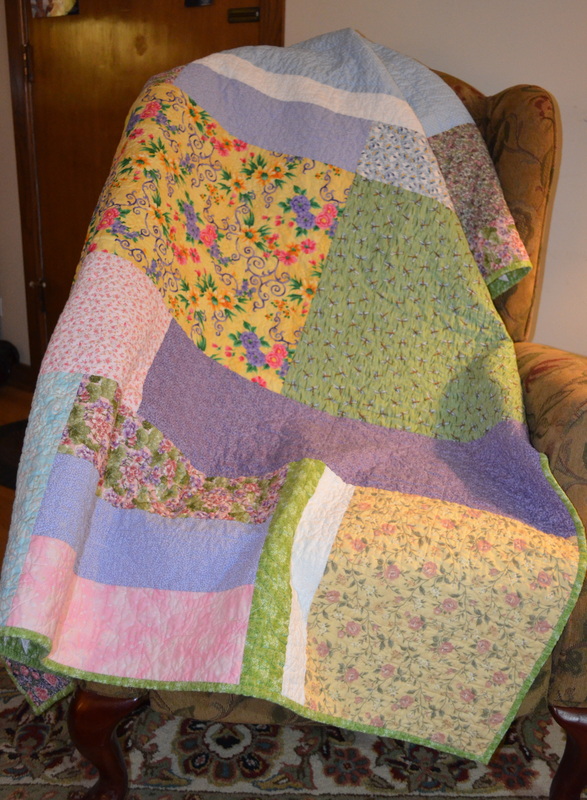 It was a free pattern that came in the mail from McCall’s Quilting entitled Summer At Mom’s…I call it Nana’s Garden. I used up a LOT of my floral scraps in the blocks and a LOT more on the scrappy back. 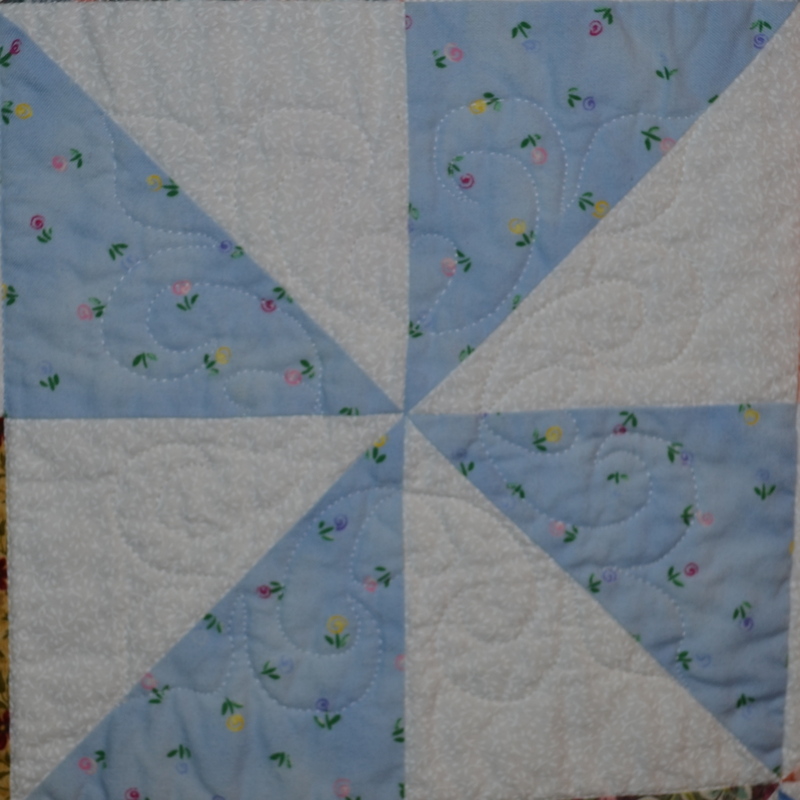 There were many hours spent quilting special “fleur de lis” designs in each block and lots of vines, leaves, and flowers in the border. But once it was washed the specialty quilting is now barely visible. But I adore the crinkled look of this quilt. 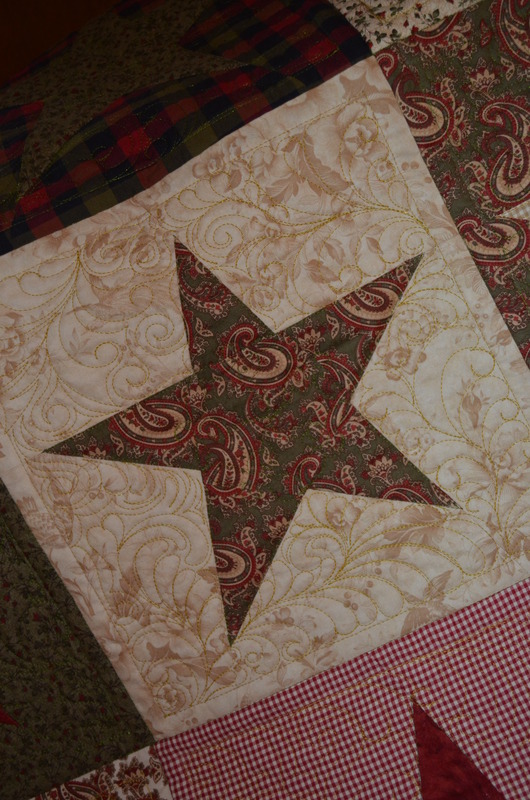 So for all of you who think you don’t machine quilt very well….just do it and wash it right away…Voila! 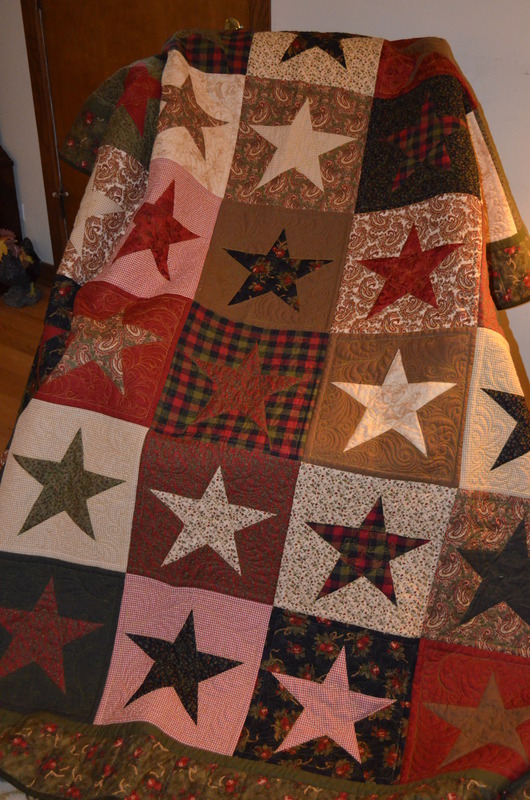 an antique looking quilt! If you look hard you can see the vines, leaves and flowers quilted in the border above and the fleur-de-lis quilting in the block below. 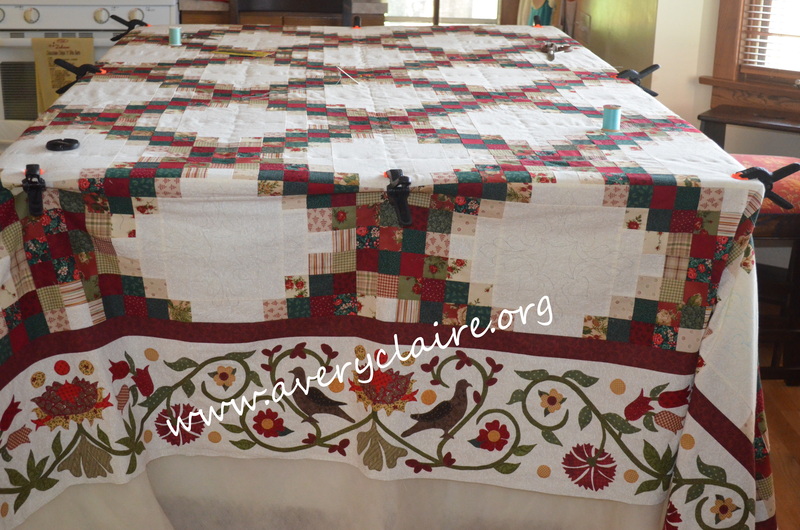 Don’t you just love that crinkled look of the quilt after washing…..and even better yet….with the scrappy back you get two quilts in one! As I mentioned on my last post, here is a photo of the Les Muguets Day gift I made for my friend Maggy. And I have one just like it. It makes my kitchen look all “Spring-like” and sunny! 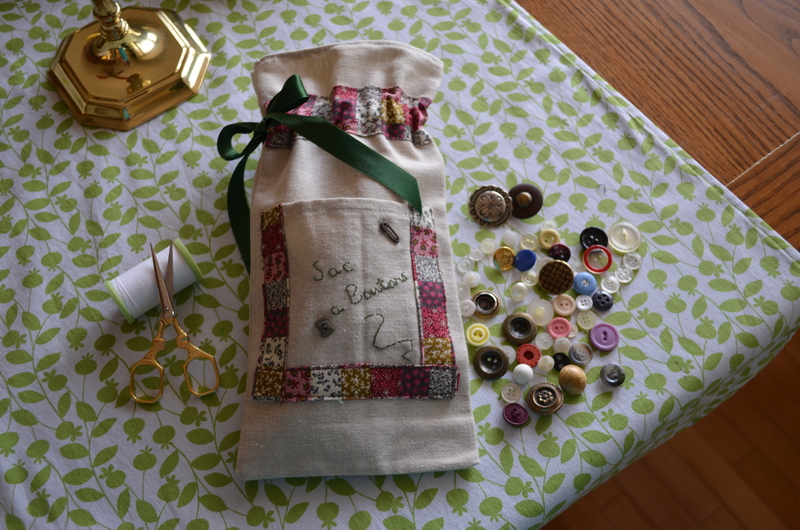 And Maggy sent to me this lovely “sac a boutons” which she handmade for me. I love it! Thank you Maggy! Well, two more projects completed in the winter months. One unfinished quilt now complete, and a new project for fun. Come back again in a day or two to see my completed hand appliqued, hand quilted finish! Yes, it’s been 6 months since I last posted. The warmth of the sun is pouring in my windows, teasing us for a couple of days with 80 degree temperatures. Now it is raining again, but everything is very green and the trees leafed out with the balmy days. I LOVE the warm weather. It feels so good. My winter was spent in completing unfinished projects. I was inspired by something I read last Fall about making a list of one’s unfinished projects and working a little on them each day. So I did. I am notorious for beginning things and not finishing them. But I want to be able to empty my drawers and closets of all of my UFOs or should I say WIPs. Here is just one. 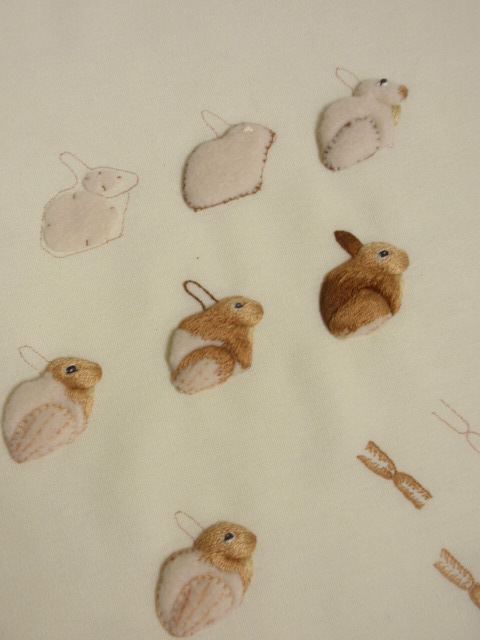 This is Berry Patch Rabbit by Cedar Hill done on 32 ct. Lambs Wool linen. I think I worked on him on and off for a couple of years. 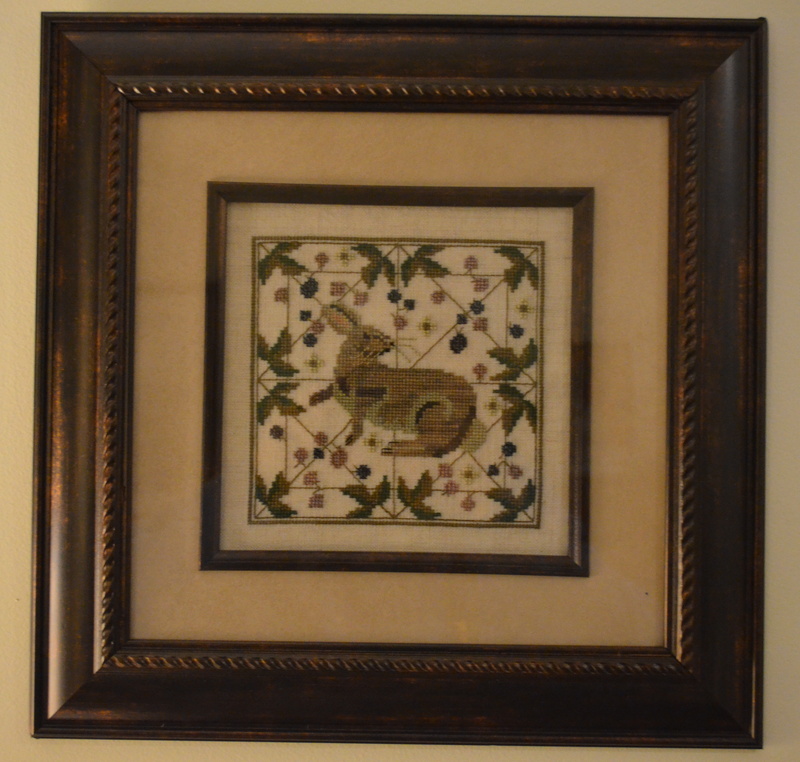 I love this little rabbit and he hangs proudly in my living room. Then I did a cross-stitch for my daughter who loves “Life” quotes. This was not a UFO, but a work of love for Kathleen for Valentine Day. 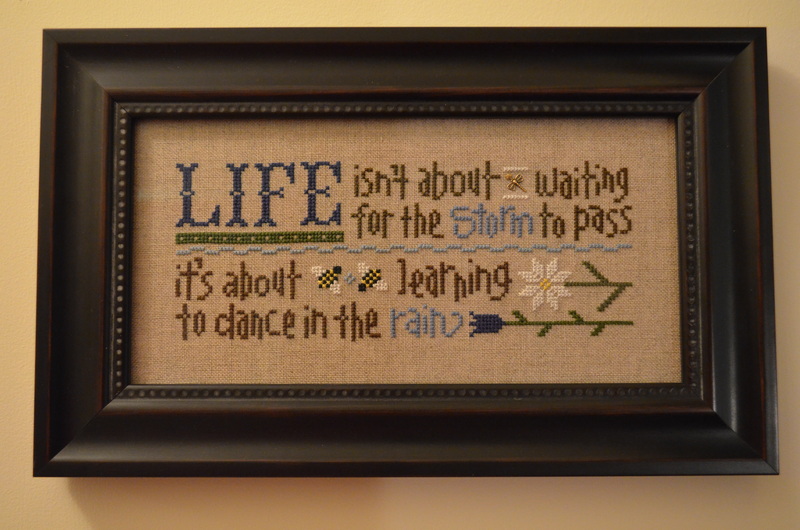 It is “Life” cross-stitch by Lizzy Kate done on 32 ct. natural linen. The linen is NOT checkered. For some reason the shadows of the linen weave shows up as checkers. She loves it and it hangs in her foyer. 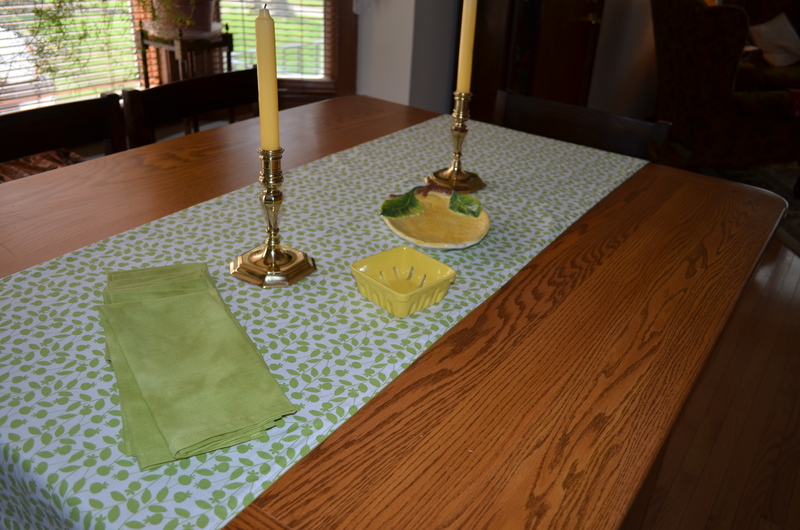 And because I was SO READY for spring, I made a new spring table runner for my island in the kitchen and made 8 coordinating napkins. 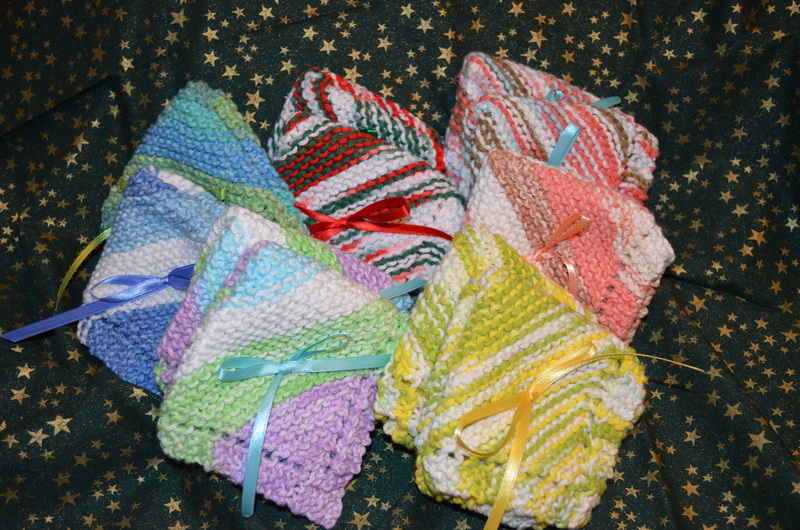 I also made a second set for my dear friend Maggy. I sent it to her as a “Les Muguets” gift. On the first of May every year, we make something for May 1st. “Les Muguets” Day (Lily of the Valley Day) is a day of friendship and one is supposed to give their friend a small bouquet of lilies of the valley…or so the story goes. I received a lovely hand made bag from Maggy. Sorry, no photos, today, but next post. I have LOTS more completed UFOS to show, so come back soon and check again. The posts are ready, just waiting for me to take some photos. I have accomplished much in just a few cold winter months. So, friends, while I have been silent for a long time…I have been very busy. Oft times I was lurking in the shadows of your blogs and admiring your work. I really enjoy everyone’s blogs and love seeing all of their work, so I am going to try to be better at posting again. 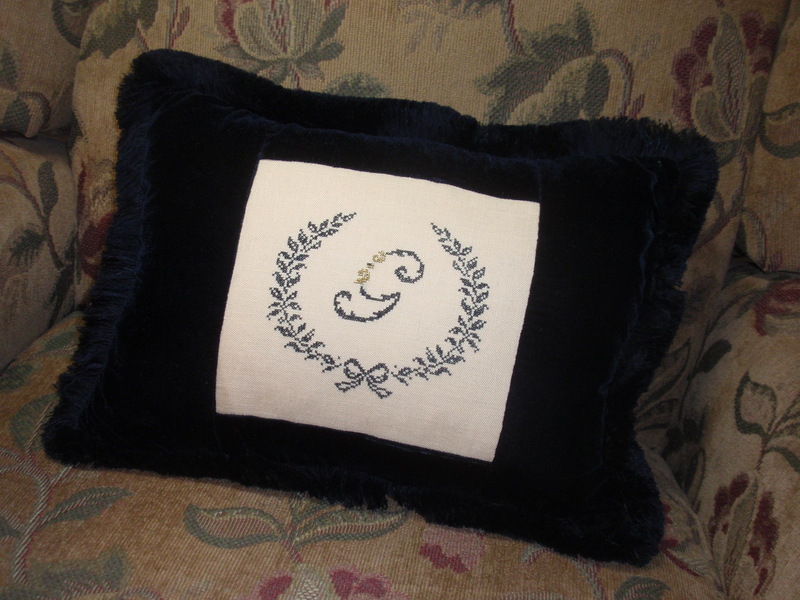 Last weekend I went with a friend of mine to a Needlework Class in Indianapolis, Indiana. 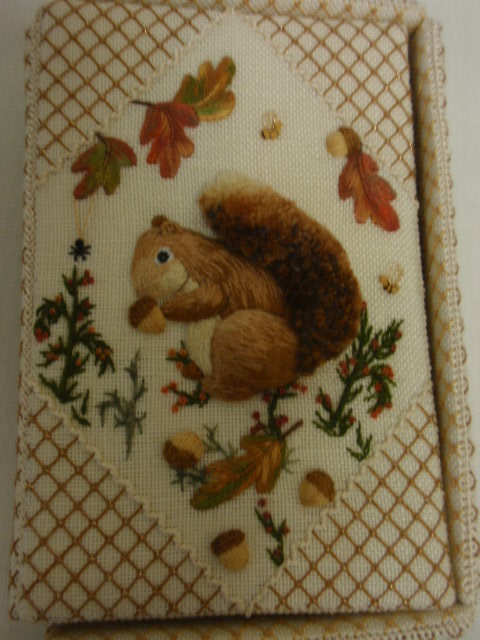 It was sponsored by the Indianapolis Chapter of the Embroiderer’s Guild of America. We belong to the chapter called Needle Artisans of Northwest Indiana (NANI) that meets in Munster. Once a year they have an event called State Day in various locations around the State. Last year it was sponsored by our Chapter here in Munster. 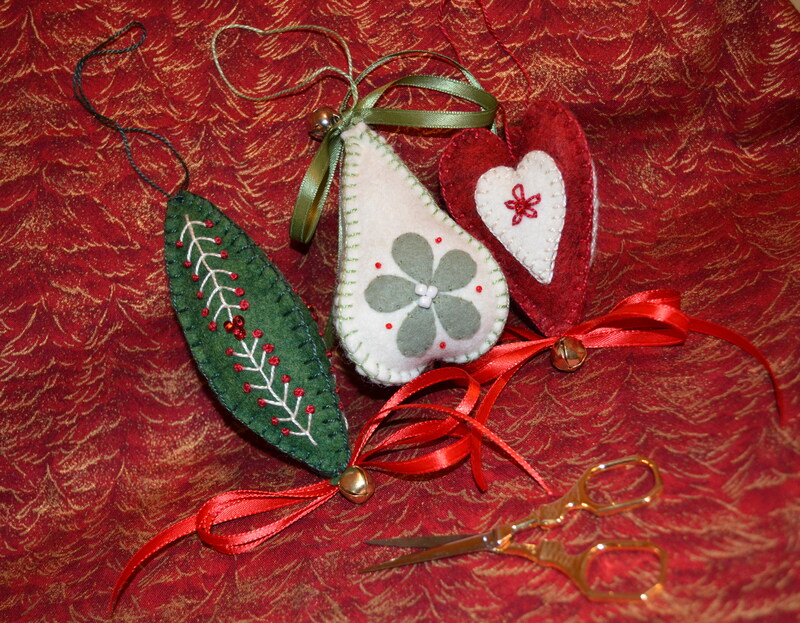 This year’s class was a lesson in “Stumpwork”…it is a style of embroidery where the stitched figures are raised from the surface of the work to form a 3-dimensional effect. It was a very beginner class, as I had never done anything like this. After one prepares the foundation by layering pieces of felt, the finished bird (or whatever you are doing) is painted with one strand of embroidery floss (needlepainting) in various colors. I very much enjoyed the process. 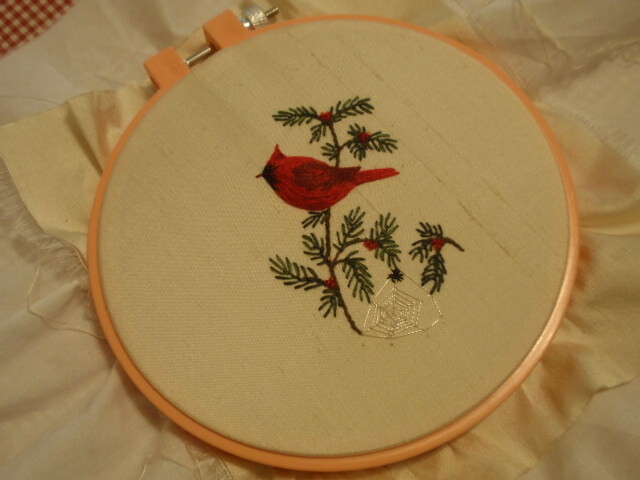 Here is my cardinal which I finished embroidering Sunday after the class. I plan to turn this into a Christmas ornament. 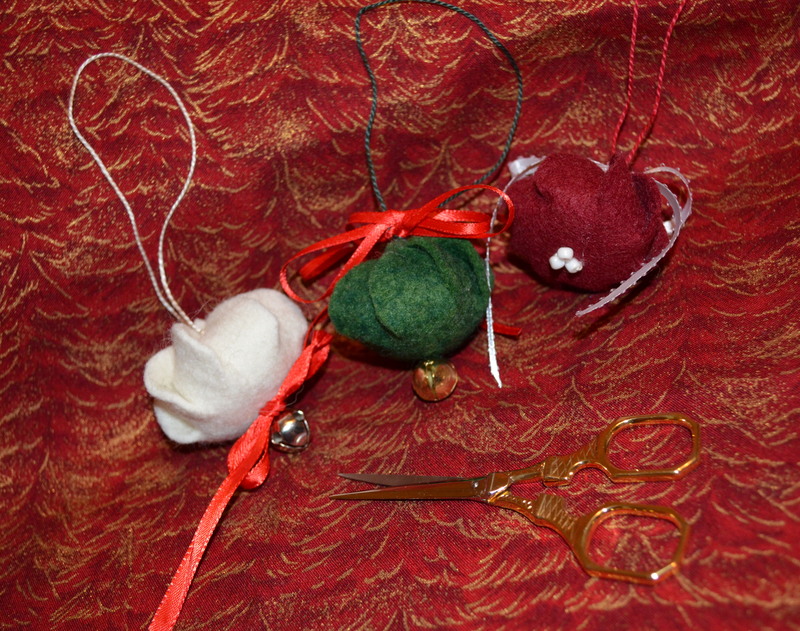 The finished ornament will measure only 2.5 x 3.5…so it is a VERY small cardinal. The designer and teacher was Marsha Papay-Gomola. She is an excellent teacher and taught a fun class. She has a website here. Her class was delightful and I would encourage anyone interested in learning something new, to check into her classes. 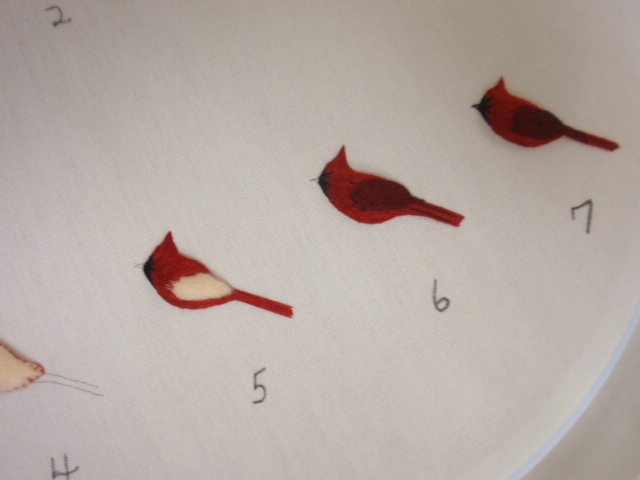 I did take photos of some of her samples she brought to the class, including the step-by-step proces for our cardinal. I think her work is magnificent. She even showed us a sample of leaves for us to have ideas in how to make a choice in finishing our cardinals. It was one of the really FUN weekends. 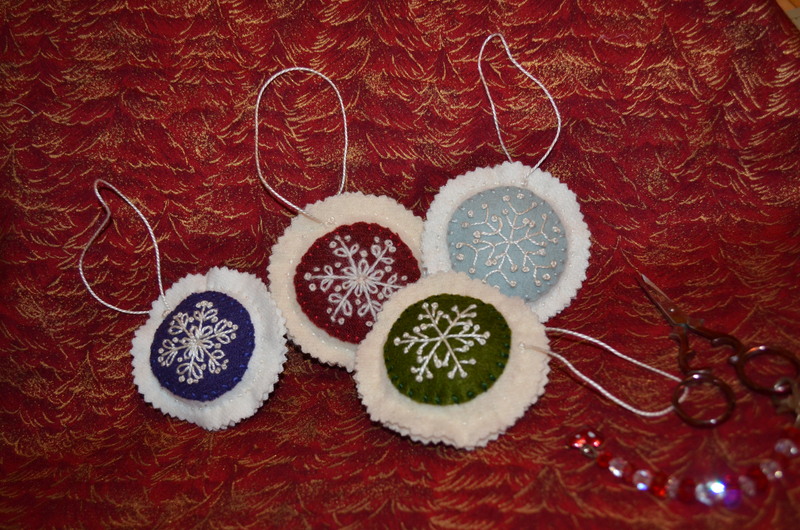 Southpaw Stitcher has many more photos on her website, so please check them out if you have not done so already. She is a GREAT traveling companion with a super sense of humor. We even did our own shop hop on the way down visiting Persnickety Stitchers in Zionsville and Needle Fever in Indianapolis, and even stopped at a quilt shop nearby, Quilts Plus. Last post I mentioned that I was working on a home dec project for my daughter for her dining room. 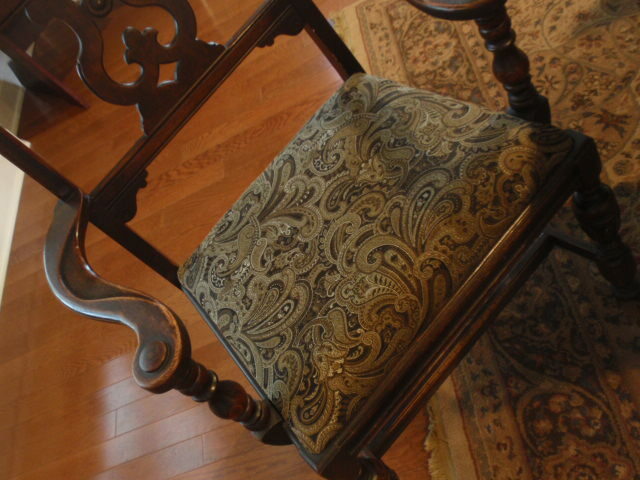 Here are a couple of photos of what I have finished: Six antique dining room chairs were recovered. 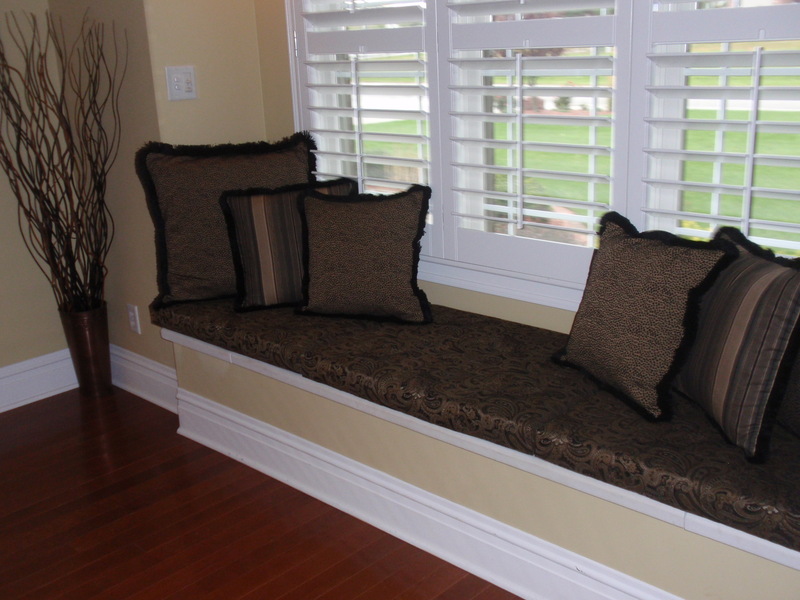 Three cushions for the window seat with zippered custom covers, six large pillows with zippered covers, one hand embroidered pillow for the center of the window seat. 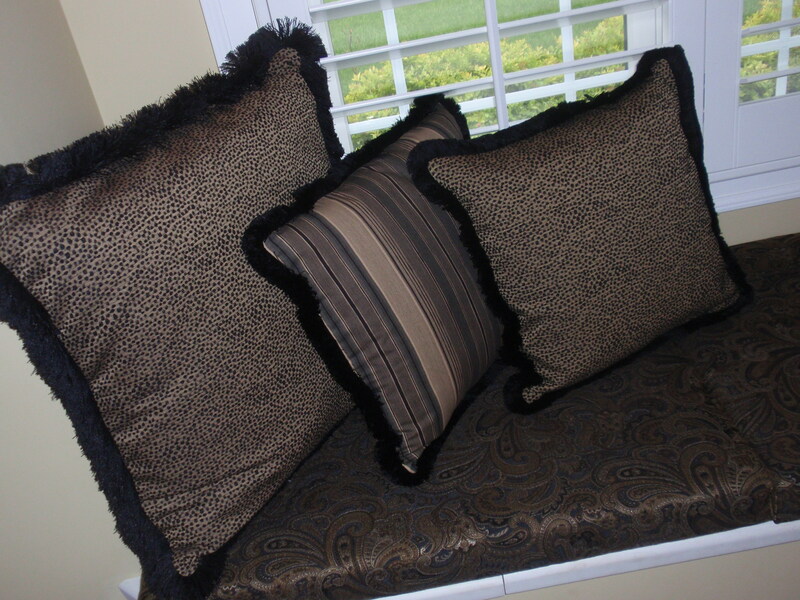 I made this black velvet pillow out of leftover velvet from a dress I made her MANY years ago for a dance. 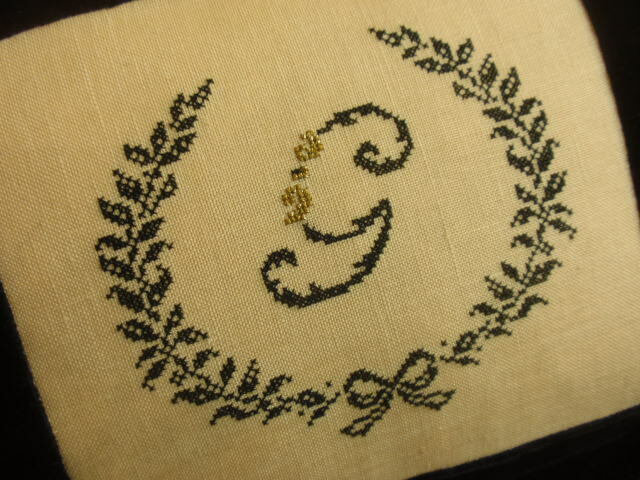 Thought it would be good memories…then I cross-stitched a deisgn with a monogram with their last initial. Still have to make the draperies and the table and buffet runners. So it’s not done yet……the story of my life!!! 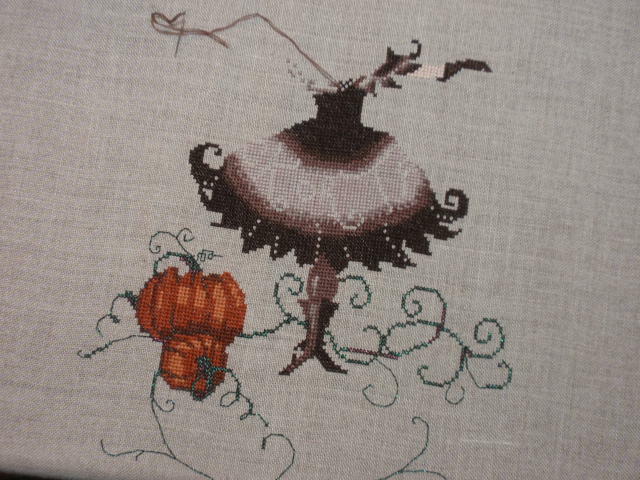 I have been diligently working on a Halloween Fairy (Nora Corbett) cross-stitch. It is from one of the cross-stitching magazines from a year or two ago, I can’t remember which one. A friend of mine stitched it and graciously donated her leftover threads and beads to me. I couldn’t resist doing this one for Halloween. I hope it will be done (even if it doesn’t get framed on time). Unfortuantely, I still have a ways to go. I have been really slow on this one. And last, but not least, I went to a neighboring quilt group meeting, Pieces and Patches. They had a very entertaining speaker that evening, Amy Walsh. 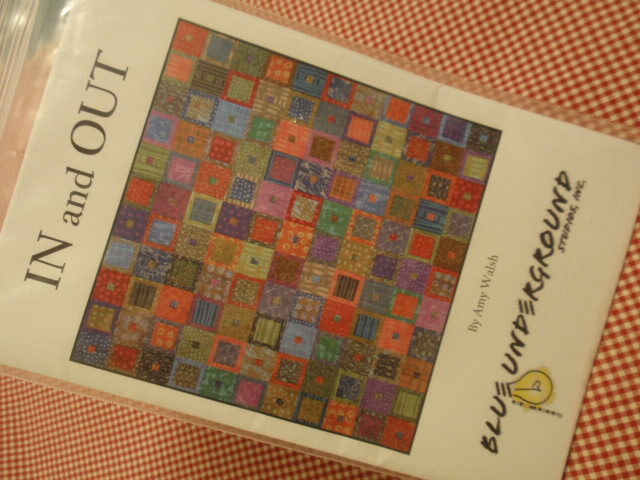 She and Janine Burke have been publishing patterns under the company name, Blue Underground Studios, since 2005. The patterns are more modern than my usual choices, but they are absolutely lovely. And lucky me, I won their favorite pattern, “In and Out.” I can’t wait to try it. They tell us that their patterns are easy and quick to make and great choices for using up your stash of fabric. 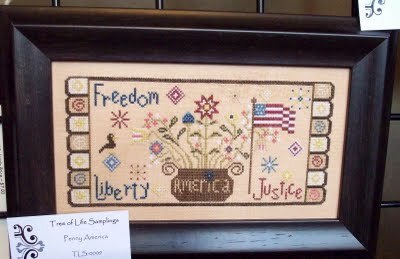 And from Inspired Needle Blog, I won a lovely patriotic needlework pattern. Please visit her website as well as the blog. I will save this one to work on for next summer!